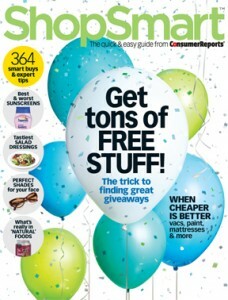 Today only, ShopSmart magazine is on sale for $14.99. Use promo code 15SS0713 at checkout to save an extra 15% off, which will bring your final price down to just $12.74! Special offer valid today (7/8) until 8:59 PST. ShopSmart magazine can be described as “Consumer Reports” for women. ShopSmart offers straight-shooting condensed articles with no hype and advertising about how to avoid overpriced, poor quality or unsafe products. Articles are researched by leading experts who perform product tests in their labs for a wide range of female-related products and write on point, short reports, including top ten lists. ShopSmart offers product recommendations and warnings on everything from appliances to cars, clothing and cosmetics, how to tips for saving money at the grocery store, top websites that can help you save money, the best cleaning products, household tools, the best power tool choices for women and fashions.